Brick Lane follows on, where Bloomsbury and Bayswater leave off. 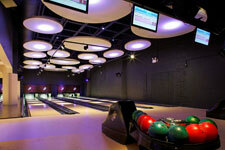 The biggest and best All Star Lanes — the UK’s original boutique bowling concept — opened recently in London’s East End. Situated on 22,000 sq ft of prime real estate at the Old Truman Brewery in Brick Lane, the third ASL, from co-founders Mark von Westenholz and Adam Breeden, has built on the same successful formula as its predecessors — including the multimedia infrastructure. 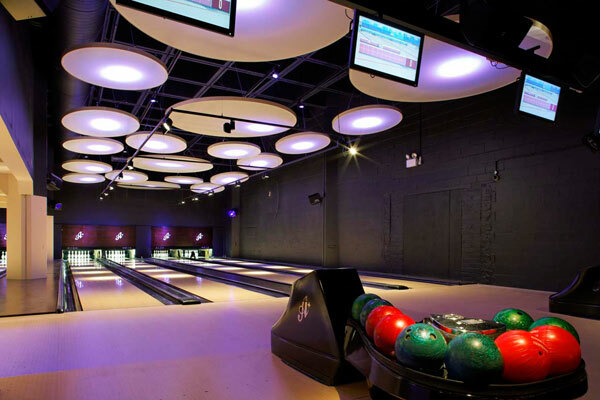 The public and private bowling lanes, cocktail bar and authentic ‘50’s-style, 200-cover diner/luncheonette are all served by audio visual systems designed by The Sound Division Group. Their integrated system is based around a top industry spec, including a portable DJ booth and Harman Pro brand premium sound reinforcement products. At the same time Sound Division Group have provided a full presentation rig for corporate use. Mixing de-luxe bowling with the finest diner cuisine, cocktails and high-octane music, the latest All Star Lanes embodies all the signature elements that were visible in the first two sites. In Brick Lane there is a total of nine lanes (six on the ground floor, the remaining three forming a 1950’s penthouse-style private lounge on the first floor), with a stylish drinking den specialising in classic American cocktails, pitchers and American beers and ales. 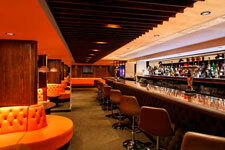 The classic interior concept was again devised by experienced architect/designer Dan Evans, who has introduced a 20ft long copper bar counter running the entire length of the lanes, providing views through to the psychedelically lit bowling area beyond. Also for the first time the bar and lanes share the same space, providing an opportunity to create a live music performance area. This will mark the next phase, and The Sound Division Group have already installed a 24-way analogue multicore as part of a site-wide cable network in anticipation of the portable rig. 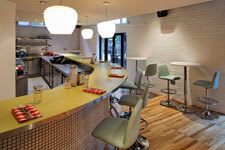 In keeping with All Star Lanes’ evolutionary ethos the multimedia has developed alongside the general interior. For the first time the industry-spec DJ booth has been made entirely portable whereas in previous venues it was fixed. Equipped with Technics SL1210, turntables Pioneer CDJ1000 CD player, an Allen & Heath XONE:62 (mixing the nightclub sound), and a Phonic compact mixer (for the venue), the plush leather-padded DJ rig can relocate to any of five different plug-in points within the building, and at each position there are also laptop plug-in points. DJ’s will benefit from the JBL Eon 10 powered speakers, which provide reference sound, while the live (Shure) mic mixing is via a Phonics mixer. From the laptop points corporate presentations can be delivered — backed up by the the Denon DVD players or high-powered Panasonic DLP projector (situated over the main lanes). This can be displayed either on the 11ft electric drop-down screen, the 50” NEC Panasonic plasma screen (in the 100-capacity first floor private room), or 42in plasma, which resides in the cocktail bar. The venue is split into three primary zones — the Restaurant, Main Bowl & Cocktail Bar and Private Bowl — although this sub-divides into a total of 11 separate zones, including the service areas. With JBL AE series subs — AL6115’s in the Private Bowl and AL6125 in the Main Bowl — adding bass extension to the powerful JBL Control 30 and Control 29AV’s, All Star Lanes is able to maintain a continuous music mix either from the the Sonos hard disk music server to the DJ’s, and eventually the live performers. The feature areas see Crown XTi4000 and XTi2000 amplifiers powering the Main Bowl system and XTi4000 and XTi1000’s running the six Control 29AV’s (and AL6115) in the Private Bowl. A further six Control 29AV’s ensure the potency of the sound is maintained in the cocktail bar. In the peripheral areas, SDG have turned to a variety of JBL Control 24C/24CT flush ceiling speakers along with 24AV’s at the various entrance, reception areas and toilets, with Control 28’s and 26C ceiling speakers in the coffee shop, and 13 white Control 25AV’s in the dining room. These are powered as appropriate by Crown XLS, CTs and XTi series amplifiers. Aside from maintaining even sound dispersion, critical to the operation is an intuitive relay matrix, in which any source can be routed to any destination. To achieve this, SDG have designed a BSS Soundweb London network with ample DSP power. 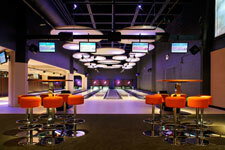 The main BLU-80 processor is configured for 16 outputs and the BLU-32 I/O expander for 16 inputs; strategically set in the three main zones are BLU-8 programmable wall remotes, while a pair of BLU-3 remote source select/volume rotary controls are used at the Bowling and Main Reception areas. And that future includes growth beyond the UK, with All Star Lanes Dublin slated for next year, followed by European target cities including Paris and Berlin.